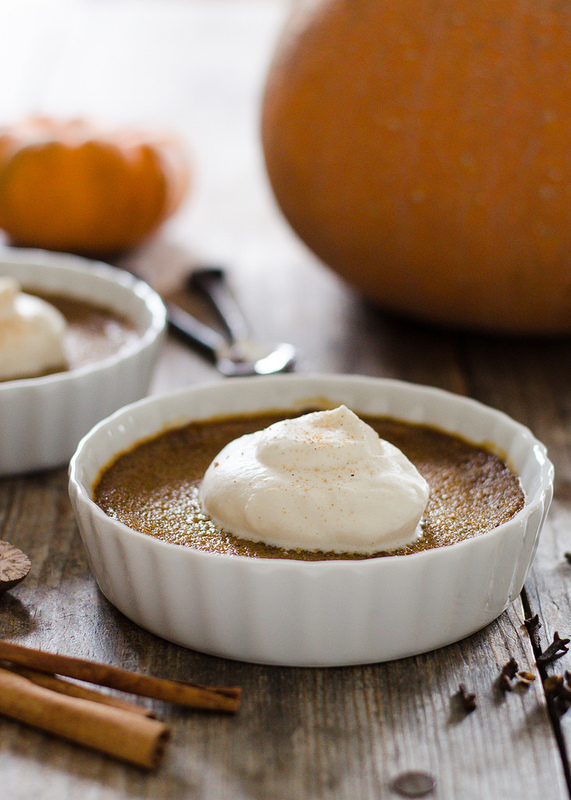 This Baked Pumpkin Custard is so easy – just mix everything together and pour into ramekins. No pie crust required! I can’t believe that Thanksgiving is next week already! We have had such a mild November. Highs in the 50s and 60s. It feels more like October! 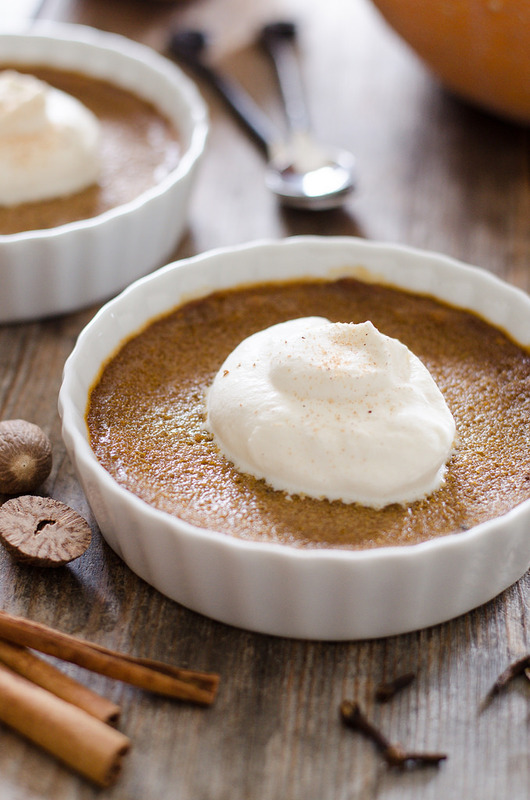 It just doesn’t seem that I’ve been able to squeeze in enough pumpkin desserts before Turkey Day. 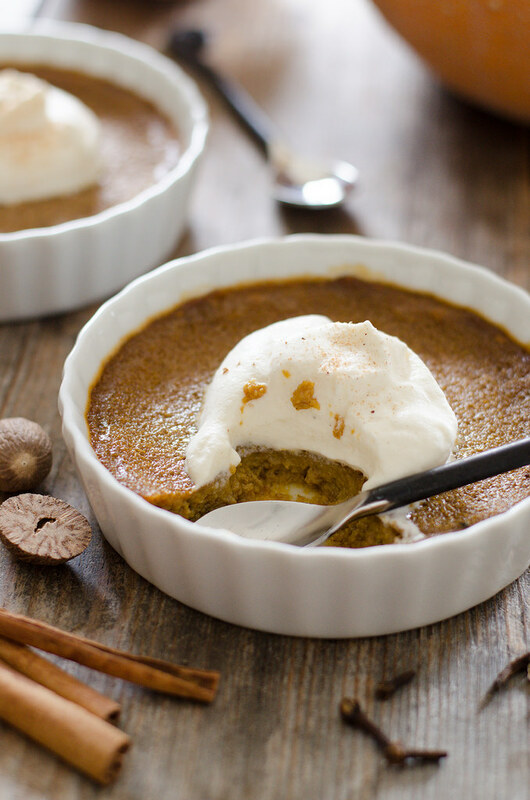 If you’re looking for an easy way to get your pumpkin fix, this baked pumpkin custard is definitely the ticket. All you need to do is whisk together the custard ingredients, pour into ramekins, and bake until set. Serve with nutmeg whipped cream and an extra sprinkling of freshly grated nutmeg on top and this will seem like a fancy dessert. 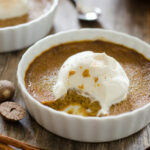 You could also make my Pumpkin Pie Pudding – another great crust-free pumpkin option! This Baked Pumpkin Custard is so easy - just mix and pour into ramekins. No crust required! 3/4 cup coconut sugar organic cane sugar, sucanat, etc. Preheat oven to 350 degrees F (175 C). Place 6 ramekins on a shallow rimmed baking sheet. Whisk together all ingredients in a medium bowl. You could also use a blender to do this. Fill ramekins about 3/4 full with the custard. Bake for about 35-40 minutes, or until just set. Cool for a bit. Serve warm or room-temperature with whipped cream (sweetened with maple syrup and flavored with a bit of vanilla extract and freshly grated nutmeg). Sprinkle extra nutmeg on top. Absolutely delicious and so refreshing to be able to make a recipe as is without having to decide how much sugar to cut out. I’ve made this several times. Ready to whip up, gone in a flash. And isn’t it nice to not have to worry about a pie crust? 🙂 So happy you enjoyed this, Heidi!